Founded in 1939, the Great China Match Factory on Peng Chau was once the largest match manufacturer in Hong Kong, with over 1000 workers at its peak in the late 1940s and its “Kowloon” and other brands of safety matches were exported to Southeast Asia and beyond. An earlier article about industries on Peng Chau in 2015 briefly touched on the firm but this article will go deeper into the firm and its owners – the family of Ong-Sung Lieu (劉鴻生, 1888-1956, better known as “O.S. Lieu”), who built a business empire in Republican China that include dominant leaders in multiple industries – match, cement, coal, textiles, enamelware, banking and shipping and earned himself the title of “King of Enterprises”. A native of Ningpo, O.S. Lieu dropped out of St. John’s University in Shanghai and made his initial fortune in coal as a comprador for the British controlled Kaiping Mines in the 1910s. The May 4th movement in 1919 triggered a nationwide support of domestically made goods and Lieu went big into industries with the assistance of his younger brother, Kyih-Sung Lieu (劉吉生, better known as K.S. Lieu, 1889-1962). He entered the match industry in 1920 with his first match factory – Hong Sung Match (鴻生火柴廠, named after himself) in Suzhou. At the time, the Chinese match industry was extremely competitive with many small local players and strong foreign competition first from the Japanese and later from the Swedes (led by Ivar Kreuger’s Swedish Match which through aggressive but controversial tactics ended up controlling 75% of global production by late 1920s) and Hong Sung lost money in its first couple of years. By investing in technology and smart consolidation, Lieu turned the situation around and when he merged Hong Sung with two other players to form Great China Match Co (大中華火柴, same English name as the one later established in HK but different Chinese name) in 1930, the firm had annual production of 122,037 crates, representing 22% of China’s annual production. At its peak, Great China Match had seven plants in the Yangtze River Delta and in 1936 Lieu formed a syndicate in attempt to establish a national match cartel in China. By then the Lieu business empire also included other prominent industrial enterprises such as Shanghai Portland Cement Works (上海水泥廠, founded in 1920) and China Woollen & Worsted Co (章華毛紡織廠, founded in 1929), the largest wool mill in China. As the Japanese occupied Shanghai, O.S. Lieu moved to Hong Kong in June 1938, leaving his younger brother K.S., his eldest son Franklin (劉念仁) and second son Julius (劉念義, “N.N. Lieu”, 1910-1967) in charge of the operations in Shanghai. Once landed in the British colony, O.S. set about building a new match plant and immediately went scouting for a location. He settled on Peng Chau whose residents welcomed his plans as a major lime kiln on the island had just went out of business. (Allegedly Cheung Chau was the first choice but residents there were concerned with the fire hazard). To finance the new venture, Lieu went to the quasi-sovereign bank which his brother K.S. was involved with – the Manufacturers Bank of China (中國國貨銀行, formed in 1929), which was led by family friend T.L. Soong (宋子良, 1899-1987), the second brother of the powerful Soong siblings and to whom O.S’s eldest daughter Ming-tsu (劉明珠, 1917-1971) was once engaged to. In June 1939, Great China Match Co Ltd was incorporated in HK with HK$300,000 in capital and according to the memoir of Lieu’s fourth son Johnson Lieu (劉念智, 1912-2003), there were over 40 founding shareholders of Great China Match in HK including members of the Lieu family, Manufacturers Bank and its executives such as Soong, local match merchants in HK and shareholders of Great China in Shanghai. The founding management team include K.S. Lieu as chairman (although Johnson Lieu mentioned T.L. Soong), O.S. as managing director, W.Y. Weng (翁文漪 1907-1978, chemistry graduate of the University of Shanghai, cousin of KMT premier and geologist Wen-hao Weng) as chief engineer and T.L. Loh (陸兆麟) as factory manager – the last two both seconded from the Shanghai plant. The plant commenced operations in April 1940 with 250 male workers, 300 female workers (majority of them from Peng Chau) and 30 office employees (the majority from Shanghai). Initially the HK plant relied on equipment and materials (including matchboxes) from Shanghai with a daily production of 30-40 crates but soon capital was expanded to HK$500,000 in August 1940 and the firm began producing its own brands such as “Great China”. Demand from HK, Macau and Southeast Asia lifted profits and the firm was earning HK$500,000 in 1940 and HK$600,000 in 1941. By April 1941, it was producing its own raw materials to produce matches such as red phosphorous and potassium chlorate. In December 1940, O.S. moved to Chunking at the request of the KMT regime to help establish the industrial economy in the wartime capital. He left the management of Great China in HK to his third son Hannibal Nyan-li Lieu (劉念禮, or “N.L. Lieu”, 1911-1995), who had joined him in HK the year earlier. A Cambridge law graduate, Hannibal had married socialite Liane Yen (who adopted her stepfather Dr. U.Y. Yen’s last name), the granddaughter of Oei Tiong-ham, the Sugar King of Java and daughter of Oei Tjong-lan (黃琮蘭, 1886-, older sister of Oei Hui-lan, the second Mrs. Wellington Koo) and Kan Ting-liang (簡崇涵, St John’s classmate of Wellington Koo) in 1936. Left: Hannibal Lieu in the UK while he was a student in Cambridge in 1930. (HPC Bristol) Right: Li Siu-po, the manager of Great China Match in the late 1940s and first chairman of Peng Chau Residents Association. In December 1941, HK fell to the Japanese and six months later in June 1942, representatives of the Japanese trading house Mitsui approached N.L. Lieu in HK asking him to consider returning to Shanghai to revive the family’s enterprises there. In November 1942, the Japanese seized the Peng Chau plant but after 10 months of negotiations with help from his brothers who had by then formed a joint venture with the Japanese in Shanghai, N.L. was allowed to re-open the Peng Chau plant in August 1943, although production for the remainder of the War was limited due to shortage of raw materials and fuel with only 11 workers working part time. In 1946, the firm resumed its operation at its pre-war office at 409, Bank of East Asia Building in Central. with expanded capital of HK$1 million and in July, the Lieu family sent Li Siu-po (李少甫, Ningpo native who joined Great China in Shanghai in 1934 and worked for the family enterprises in Hangzhou and Szechuan) as the new factory manager of the Peng Chau plant in HK. 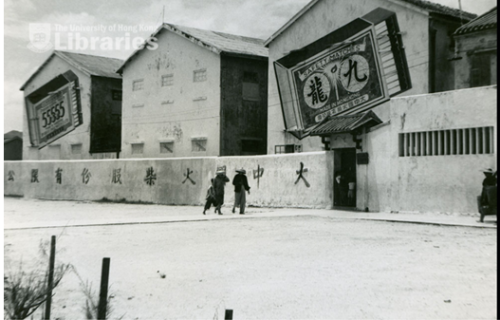 When the Peng Chau Residents Association was formed in early 1947, Li as the manager of the largest employer on the island was elected its first chairman despite not being a Peng Chau native and being a relative newcomer to HK. By 1949 however, J. T. L. Chan (Chen Tsung-lien) was listed as acting manager and Chan was listed as manager of the firm until the 1960s. The early post-War years were prosperous for Great China as its brands such as “Kowloon” “55555” and “A1” were well received in export markets as Pakistan, Indonesia, Singapore, Thailand. At its peak in 1949-50, over 1000 workers worked in the plant and according to recollection of former workers, even illegal child labor (each paid HK$2.50 per day, working from 6am to 6pm) was employed to meet the production demand although free schooling was also provided. In January 1948, an explosion at the factory’s laboratory killed one staff member (a Peng Chau native) and seriously injured one chemist (Ningbo native). In 1949, the year of regime change in China, the board of directors of Great China Match Co Ltd in HK included T.L. Soong, T.Y. Chang, S.C. Chang, Y.L. Yang, T.C. Kaung and 4 Lieu family members (O.S., K.S., N.L. and N.N.) with N.N. as managing director (he was also in charge of the match business in the mainland while N.L. was in charge of the cement business). It is unclear if the Soongs held on to their shares of Great China Match after 1949. However, Yen-chuen Yih Dunn (鄧以誠), an executive at Soong’s Manufacturers Bank and Fu Chung Corporation (also a University of Washington business graduate and involved in the state sponsored China Tea Corporation) who happens to be the father of Baroness Lydia Dunn, was a shareholder of the firm with 333 shares at his death in 1965 and in 1993 Baroness Dunn filed a writ against the firm with the Supreme Court claiming $486,679 in owed dividends from stocks owned by her late father. The Lieu family was split on the new Communist regime in the mainland in 1949 – K.S. and Franklin left Shanghai and moved to HK for good while O.S. and the rest of the family moved back to Shanghai after an extended stay in HK. In 1951, business turned south for Great China Match in HK and the factory was only opened for 3 days per week, later extended to 4 days based on labor demands. In August 1952, the Pakistani government restricted the import of matches, costing Great China a significant market. The firm’s production was cut in half from 2000 crates to 1000 crates per day and when that was not enough to stem the losses, the factory closed its operations and laid off over 640 workers in November, each given severance pay of HK$40. Two months later in January 1953 however, new orders from Southeast Asia (especially Indonesia) picked up and the factory resumed operations hiring back about 221 workers. In 1958, a fire in the plant caused HK$8000 worth of damage. Meanwhile in Shanghai, O.S. died in 1956 of a broken heart as his enterprises were nationalized and his sons were purged in many political struggles. In October 1962, K.S. Lieu died in HK at the age of 74 and was survived by 4 sons and 5 daughters. The same year, N.L. with the help of then ex-wife Liane, was finally allowed to leave Shanghai for HK where he became manager of Great China Match and lived off its dividends. By the 1970s, cigarette lighters had reduced the importance of matches and in 1976, the Great China Match factory in Peng Chau was closed and the firm was finally dissolved in 2006. The factory buildings were torn down and all that remained of this once mighty industrial enterprise were white boundary stones laid around the premise. The Lius of Shanghai by Sherman Cochran, Harvard University Press. This article was first posted on 26th February 2018.